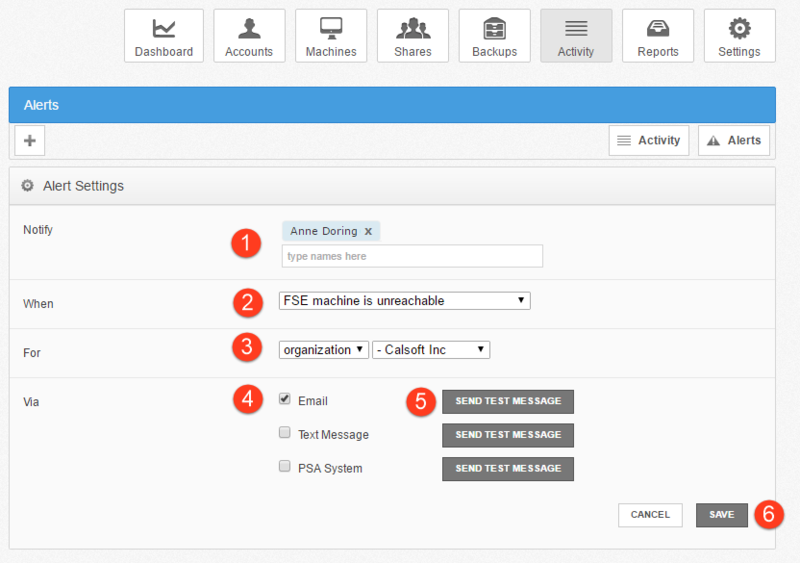 The Activity Log tab can be used to create alerts so that you are notified when important events occur in the system. Activity alerts are especially useful when monitoring events that can impact an organization or data access. For example, you can create an alert for when a File Server Enablement machine is unreachable for five minutes. This alert proactively monitors the state of a file server that is syncing to the cloud, allowing you to address any issues as quickly as possible. For more information on File Server Enablement, please reference the Cloud-Enabling a Server Using File Server Enablement Knowledgebase article. In the Organization navigation menu, select the organization in which you want to create the activity alert. The selected organization displays. In the Notify field, enter the name(s) of users who should receive the activity alert. The field will populate as you type, based on the characters that you enter. In the When drop-down menu, select FSE machine is unreachable. In the For field, select the organization to which this alert will apply. In the Via field, enter your preferred method of alert delivery. You can choose to receive alerts through email, text message, or a pre-configured PSA system. Optionally, click the Send Test Message button to test your selected delivery method. The activity alert is now configured. You will now be notified when a File Server Enablement machine is unreachable for five minutes.